NETHERLANDS: A high-voltage substation has been installed at the 129MW Eneco Lucterduinen offshore project in the Dutch North Sea. 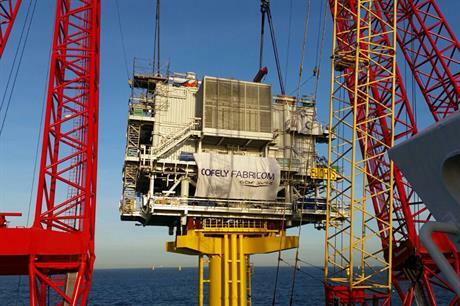 The 900-tonne platform was installed by heavy lifting vessel Rambiz, chartered by Belgian firm Scaldis. According to Eneco, Luchterduinen's substation is the largest ever installed in Dutch waters. It measures 24 metres long, 23 metres wide and 16 metres high. It will be used to transfrom the electricity produced by the 43 MHI-Vestas V112-3MW turbines from 33kV to 150kV for transmission to shore. The substation was designed and built by Belgian engineering firms Cofely Fabricom, lemants and CG. The Luchterduinen wind farm is being built 23 kilometers off the Dutch coast, between Noordwijk and Zandvoort. It is due to be completed by the end of this year.